با افزایش میانگین دمای کره زمین و به وجود آمدن تغییر اقلیم و همچنین مصرف بی‌رویه آب‌های زیرزمینی، جوامع امروزی با خطری بسیار اساسی و مهم به نام کمبود آب مواجه شده‌اند. رشد جمعیت، نیاز به امنیت غذایی، تغییرات اقلیمی و نیازهای کشاورزی جوامع بین‌المللی را مجبور به جستجو برای منابع جایگزین آب کرده است. منابع آب نامتعارف، جایگزین‌هایی هستند که برای منابع آب شیرین موجود در کره زمین، معرفی‌شده‌اند. یکی از مهم‌ترین منابع آب نامتعارف، آب‌های شور و لب‌شور به شمار می‌آیند. با توجه به وجود منابع عظیم آب شور در کره زمین، نمک‌زدایی آب روشی کارآمد برای غلبه بر بحران کم‌آبی به‌حساب می‌آید. فرایندهای نمک‌زدایی به دو دسته کلی فرایندهای گرمایی و فرایندهای غشایی تقسیم می‌شود. در این مقاله ابتدا به بررسی روش‌های مهم و پرکاربرد در سطح جهان پرداخته و سپس اثرات فرایند نمک‌زدایی از منظر اقتصاد و انرژی در روش‌های مختلف و متداول این فرایند موردبررسی قرار می‌گیرد. درنهایت نمونه واحدهای نمک‌زدایی در نقاط جغرافیایی مختلف جهان از این حیث بررسی خواهد شد. Al Hashemi, R., Zarreen, S., Al Raisi, A., Al Marzooqi, F.A., and Hasan, S.W., (2014), “A review of desalination trends in Gulf Cooperation Council Countries”, International Interdisciplinary Journal of Scientific Research, 1(2), 72-96. Al-Mutaz, I.S., (1991), “Environmental impact of seawater desalination plants”, Environmental Monitoring and Assessment, 16(1), 75-84. Attia, N.F., Jawad, M.A., and Al-Saffar, A., (2016), “The integration of desalination plants and mineral production”, Desalination and Water Treatment, 57(45), 21201-21210. Barker, M., (2003), Desalination in the United States, Frost & Sullivan, Industry Analyst, Environment Group. Chandrashekara, M., and Yadav, A., (2017), “Water desalination system using solar heat: A review”, Renewable and Sustainable Energy Reviews, 67, 1308-1330. Dawoud, M.A., (2011), “Water import and transfer versus desalination in arid regions: GCC countries case study”, Desalination and Water treatment, 28(1-3), 153-163. Del Castillo, J., (2004), “Desalination costs at the Spanish Mediterranean Coast, The Bahia de Palma, Mallorca Case”, International Conference on Desalination Costing, Limassol. Fritzmann, C., Löwenberg, J., Wintgens, T., and Melin, T., (2007), “State-of-the-art of reverse osmosis desalination”, Desalination, 216(1-3), 1-76. Ghaffour, N., Bundschuh, J., Mahmoudi, H., and Goosen, M.F., (2015), “Renewable energy-driven desalination technologies: A comprehensive review on challenges and potential applications of integrated systems”, Desalination, 356, 94-114. Ghaffour, N., Missimer, T.M., and Amy, G.L., (2013), “Technical review and evaluation of the economics of water desalination: current and future challenges for better water supply sustainability”, Desalination, 309, 197-207. 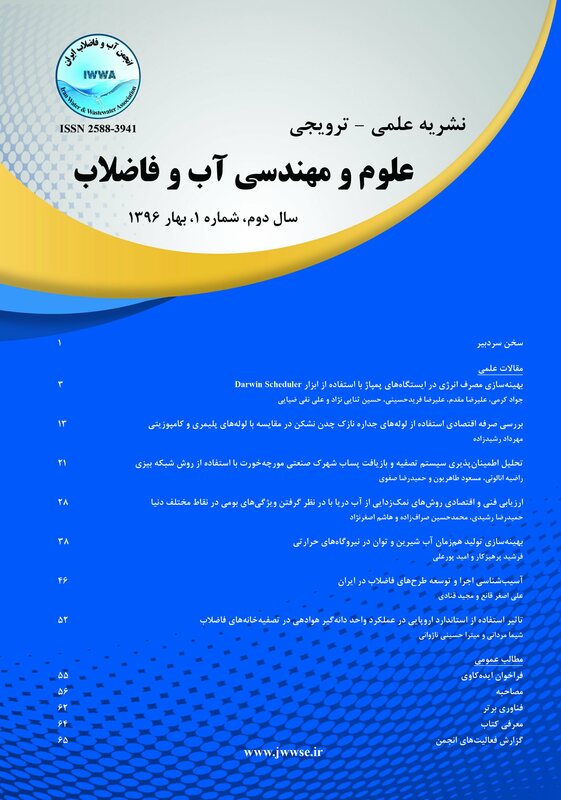 Ghalavand, Y., Hatamipour, M.S., and Rahimi, A., (2015), “A review on energy consumption of desalination processes”, Desalination and Water Treatment, 54(6), 1526-1541. Gorjian, S., and Ghobadian, B., (2015), “Solar desalination: A sustainable solution to water crisis in Iran”, Renewable and Sustainable Energy Reviews, 48, 571-584. Khawaji, A.D., Kutubkhanah, I.K., and Wie, J.M., (2008), “Advances in seawater desalination technologies”, Desalination, 221(1-3), 47-69. Kucera, J., (2014), “Introduction to desalination”, Desalination: Water from Water, 1-37. Li, C., Goswami, Y., and Stefanakos, E., (2013), “Solar assisted sea water desalination: A review”, Renewable and Sustainable Energy Reviews, 19, 136-163. Likhachev, D.S., and Li, F.C., (2013), “Large-scale water desalination methods: a review and new perspectives”, Desalination and Water Treatment, 51(13-15), 2836-2849. Lutz, W., Sanderson, W.C., and Scherbov, S., (1997), “Doubling of world population unlikely”, Nature, 387(6635), 803-805. Mezher, T., Fath, H., Abbas, Z., and Khaled, A., (2011), “Techno-economic assessment and environmental impacts of desalination technologies”, Desalination, 266(1), 263-273. Mickley, M., (2012), “US municipal desalination plants: number, types, locations, sizes, and concentrate management practices”, IDA Journal of Desalination and Water Reuse, 4(1), 44-51. Miller, J.E., (2003), Review of water resources and desalination technology, Sandia national labs unlimited release report SAND. Mohsen, M.S., Akash, B., Abdo, A.A., and Akash, O., (2016), “Energy Options for Water Desalination in UAE”, Procedia Computer Science, 83, 894-901. Nair, M., and Kumar, D., (2013), “Water desalination and challenges: The Middle East perspective: a review”, Desalination and Water Treatment, 51(10-12), 2030-2040. Rijsberman, F.R., (2006), “Water scarcity: fact or fiction?”, Agricultural Water Management, 80(1), 5-22. Sharon, H., and Reddy, K.S., (2015), “A review of solar energy driven desalination technologies”, Renewable and Sustainable Energy Reviews, 41, 1080-1118. Shatat, M., Worall, M., and Riffat, S., (2013), “Opportunities for solar water desalination worldwide”, Sustainable Cities and Society, 9, 67-80. Tonner, J.B., (2002), “Desalination in America”, Water Quality Products, 7(11), 12-13. Wang, O., (2016), “Desalination by evaporation: A review”, Desalination, 387, 46-60.